ELECTRICAL WIRING INDUSTRIAL, 15E is the complete, step-by-step guide to wiring industrial buildings according to the current 2014 National Electrical Code. 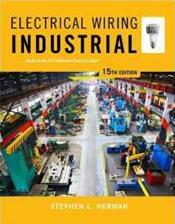 An ideal on-the-job reference for apprentice and journeyman electricians, building contractors, and anyone working in the electrical field, ELECTRICAL WIRING INDUSTRIAL,15E presents concise, straightforward information in a practical, task-oriented style. Chapter topics explore all fundamentals, from installing new electrical service and changeovers from old systems to project planning and maintenance procedures. The book highlights the 2014 National Electrical Code throughout the readings to demonstrate code updates, as well as how to apply requirements to sitework, feeder bus systems, panelboards, fiber optics, harmonics, and more . In addition to a full sample set of industrial building plans, ELECTRICAL WIRING INDUSTRIAL, 15E illustrates concepts with stimulating drawings, photographs, and other graphics to support learning and develop the reasoning skills that can elevate you to the next level of your career.